For our Terms and Conditions, please see this page. Q: What type of barrels do you manufacture? A: We offer precision button-rifled, hand-lapped barrels in either 416R Stainless Steel or 4140 Chrome-Moly Steel. Our range of offerings include AR Barrels (AR15 and SR25/LR-308/DPMS formfactor), Savage Prefits (both small and large shank), Remington 700 "Rem/Ages" Prefits, Remington 783 Prefits, Ruger Precision Rifle Prefits, contoured blanks and unturned blanks. Q: Can I make changes to my order after I've placed it? A: There Will Be Absolutely NO Changes To Orders Allowed After 2 Weeks. This Includes Changes of Address. Any Changes Made Before The Two Week Deadline Are Subject To A $35 Order Change Fee. Q: What kind of discounts do you offer for military/law enforcement/first responders? A: Free Shipping for first responders. Just email a picture of your first responders ID card to rsutton@x-caliber.net and we will reimburse your shipping on Web orders. Free Shipping only applies to full priced orders. Q: What are your order fulfillment lead times? Q: What are the stipulations regarding your 1 MOA guarantee? A: Due to a lack of industry standards, X-Caliber will only guarantee 1 MOA or less on barrels with Young Mfg., JP Enterprises or Rubber City Armory bolts, headspaced to them by X-Caliber Barrel & Mfg. There is no guarantee of 1 MOA or less on barrels less than 16"
Q: What are the terms and conditions regarding your warranty? A: Any alterations done to an X-Caliber Barrel & Mfg. 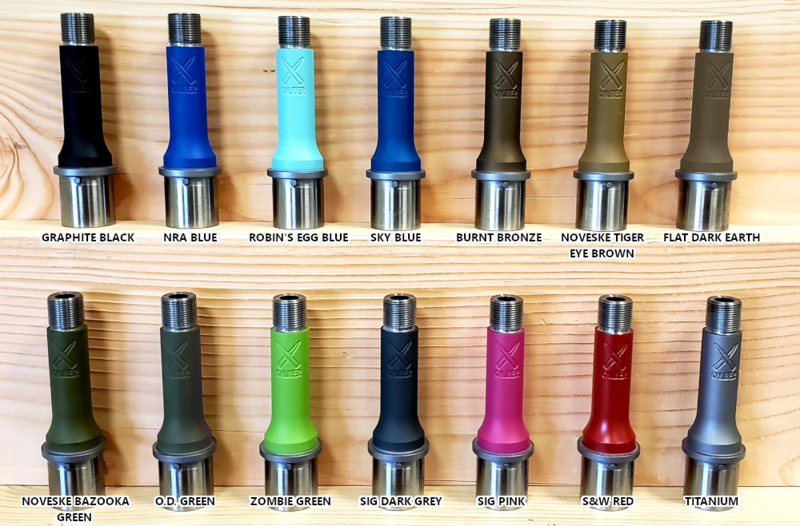 barrel releases X-Caliber Barrel and Mfg. of any and all responsibility. Q: What is your policy regarding cancelled orders? A: Credit card orders cancelled before steel is cut is subject to a 5% reimbursement fee. Orders cancelled after steel has been cut is subject to a 15% restocking fee. Q: Can I get signature confirmation for delivery on my order? A: Customers may request a signature required on our FedEx shipping. There will be an extra $5 fee for the service. Q: What benefits does opting to have my barrel Cryo-Treated afford? A: Cryo advantages: 50 to 60 fps increase at the muzzle, less fouling, tighter groups, 30% lower core temperature, minimal cold-bore shift, longer bore life. Q: Can I combine sales, promotions and coupon codes in a single order? A: No. Only one (1) sale, promotion or coupon code is valid per order. In some cases, while the cart checkout page may allow for more than one sale, promotion or coupon code to combine and complete as an order, we will be required to contact the purchaser and make corrections to the order before we can begin processing that order. A: Please refer to our Conditions of Use Page. Q: What is your recommended barrel break-in procedure?